McCabe, James W.; McCabe, Annie G.; McFarlane, Mary; Deady, Jere; Lloyd, A. C. Jr.; McCabe, Rosanna; Mulhall, Jno. T.; Anderson, Frithiof; Mulhall, John T.; Ernsberger, W. H.; Embody, Geo. 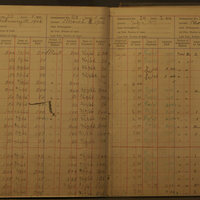 C.; Dickson, W. W.; Lothrop, _; Lothrop, C. D.; Zahner, M. H.; Adams, Geo, F.; McCrea, Ella M.; Newlandt, E. H.
Owned by Dee Biegler of Spokane, “Assessment Record Chewelah Copper King Mining Company,” Crossroads Archive, accessed April 20, 2019, http://crossroadsarchive.net/items/show/4134.